It's a good time to be a banker. President Trump is expected to roll back some of the financial regulations that were put into place during the Obama administration. And the Federal Reserve is expected to give banks another gift Wednesday in the form of an interest rate hike. Higher rates tend to make loans to people and businesses more profitable for big banks. That's made investors giddy. Bank of America's (BAC) stock has soared 15% this year. JPMorgan Chase (JPM) is up 6% and not far from an all-time high. So is scandal-ridden Wells Fargo (WFC). And a top bank ETF, the Financial Select Sector SPDR (XLF) fund, is up 7% in 2017. So how much longer can the bank party last? It's still not clear how Trump may seek to change the package of regulations known as Dodd-Frank. But he signed two directives last month after meeting with bankers -- and that has made investors more confident. One called for a review of the Wall Street reform law, and the other delayed the implementation of what's known as the fiduciary rule, a regulation that requires financial advisers to put their clients' best interests first -- not those of their firms. JPMorgan Chase CEO Jamie Dimon, arguably the nation's best-known and most respected banker, has expressed optimism about the changes in Washington, too. He said in the bank's earnings release in January that "there is opportunity for good, rational and thoughtful policy decisions to be implemented, which would spur growth, create jobs for Americans across the income spectrum and help communities." Dimon is one of 16 CEOs on Trump's Strategic and Policy Forum, an advisory group that includes IBM (IBM) CEO Ginni Rometty, Disney (DIS) CEO Bob Iger, GM (GM) CEO Mary Barra and Walmart (WMT) CEO Doug McMillon. And now he's chairman of the Business Roundtable, a group of CEOs that promotes business-friendly policies in Washington. Dimon, answering a question from CNNMoney during a press call after the earnings report in January, also said he is "comforted" that Trump has put "professionals" in the administration. Those include ex-Goldman Sachs (GS) banker Steven Mnuchin as Treasury secretary, billionaire investor Wilbur Ross as commerce secretary and former Exxon Mobil (XOM) CEO Rex Tillerson as secretary of state. Mnuchin isn't the only Goldman alum in the Trump administration. Former chief operating officer Gary Cohn heads Trump's Council of Economic Advisors. Dina Powell, who was in charge of many of Goldman's philanthropic efforts, is now a senior adviser to Trump too. He also has nominated Goldman veteran Jim Donovan to be Mnuchin's deputy in the Treasury department. And even though Trump's nominee to lead the SEC, lawyer Jay Clayton, isn't technically a former Goldman employee, he has represented Goldman and other large banks. Clayton's wife also works for Goldman. Banks may have another ally in Washington besides Trump and his army of Vampire Squids: Fed chair Janet Yellen. The Fed already raised rates in December. That followed a hike in December 2015 -- its first since 2006. 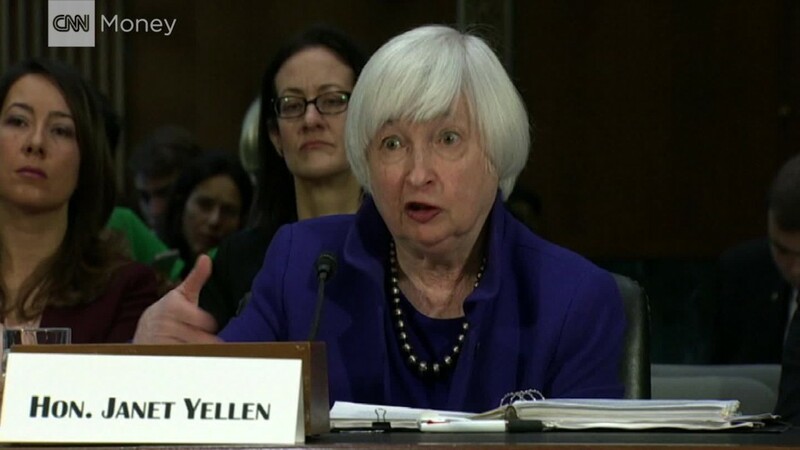 But Yellen -- who may or may not still be Fed chair in 2018 after her term expires next February -- has suggested the Fed could boost rates several times this year and next year. Any increase in the Fed's benchmark lending rate would allow banks to charge more interest on mortgages, credit cards, auto leases, small business loans and other forms of debt. What's more, any signals from Yellen that the Fed will keep gradually raising rates could push more companies to make deals before the cost of borrowing money becomes too high. More startups may look to go public, as well. The environment for stocks tends to be more favorable when rates are lower. There are already hopes on Wall Street that Snapchat's (SNAP) recent IPO could pave the way for other high-profile unicorns like Uber, Airbnb, Pinterest and SpaceX to file for initial public offerings of their own. And any pickup in merger activity and IPOs would be a boon to big banks like JPMorgan Chase, Goldman, Morgan Stanley (MS), Citigroup (C) and BofA because it would mean more advisory fees. Finally, higher interest rates could lead more people to put money in savings accounts, which would also help banks. Many Americans, particularly those nearing retirement or already retired, feel that the Fed has been punishing savers by keeping rates too low. Money put in a good, old-fashioned bank account has earned next to nothing for years. So it looks like even happier days may lie ahead for banks and their investors -- as long as Trump and Yellen live up to their promises.